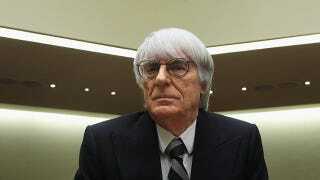 Bernie Ecclestone, billionaire Formula 1 overlord and Muppet, has given the parties behind the troubled 2012 United States Grand Prix at Austin's Circuit of the Americas exactly one week to fix everything before the race is finally cancelled. The World Motor Sport Council signs off on the official 2012 racing calendar next Wednesday, December 7, and Ecclestone apparently will accept the completed package at that final meeting if necessary. If the conflicts between race organizers and track builders and other interests aren't completely resolved by then, however, the race gets pushed back a year and may never happen at all. Speaking with reporters over the phone, Ecclestone said, "The deadline hasn't been met so we are still trying to make it happen ... they need to get some money and a pen." We have reason to believe that making this happen will take much more —and longer — than an ATM withdrawal and a stop at Staples, sadly.